The New Richmond Board of Education meeting in special session Monday, Feb. 3 approved the use of ‘Blizzard Bags’ to make up any future days that schools must be closed during the 2013-14 school year due to inclement weather but declined to make any changes to the current school calendar. Supt. Adam Bird withdrew a recommendation that Feb.17 (President’s Day) as a make-up day after getting requested feedback from teachers and parents who had made plans for Feb. 17 based on the published calendar. “We had about 20 teachers who had made travel plans for that holiday weekend and about a dozen parents who had scheduled medical appointments for their students that day,” said Bird. 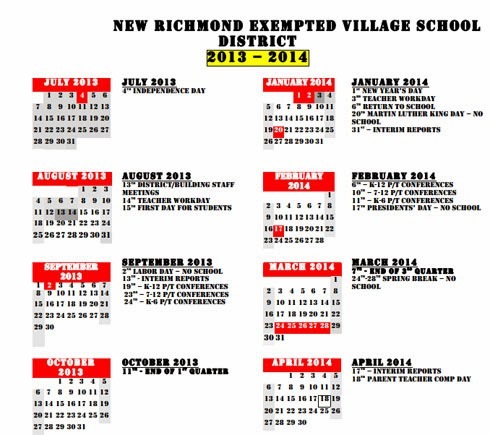 The current calendar for the New Richmond Exempted Village School District calls for make-up days to be, in order, May 23, 27, 28, 29 and 30. Up to three ‘Blizzard Bag’ days will be added as needed. With Monday’s school closure, New Richmond has been closed eight days due to inclement weather, three more than the state allotted five. “Unfortunately, you cannot add Blizzard Bag days after the fact so we cannot use them for the calamity days we have to make up,” said Bird. The last day for seniors on the current schedule is Monday, May 19 with the last day for all students on May 22. The three make up days for seniors would be May 20, 21 and 22, the day before their graduation on May 23. Ohio Gov. John Kasich has asked the Ohio General Assembly, which will be back in session next week, to approve four additional calamity days. “If that happens these changes would be unnecessary,” said Bird. The Blizzard Bag program was implemented by the Ohio Department of Education in 2011 and allows school districts an extra three days in addition to the standard five calamity days, meaning they will not have to make up those days. 1. BB assignment should be posted by noon of the snow day. It is acceptable to post the assignment in advance. 2. The posted assignment should be current or related to the present unit that the class is engaged in, or reinforces concepts recently taught in class. 3. The amount of work in the assignment should equal the amount of work that would have been done in one day. 4. The amount of rigor in the assignment should closely replicate the in-class experience. 5. The assignment should be posted in the homework section on Progress Book for MS and HS students. Elementary teachers could post the assignment this way, or give the assignment when students return, or give to students in advance. Matt Prichard will follow up this email with some directions on how to post to Progress Book as a reminder. 6. Students who do not have internet access at home will be handed the assignment on the day that school is back in session. It is permissible to send the assignment home with the student in advance of the snow day. 7. Students will have 2 weeks to complete the assignment. Students who do not complete the assignment within this period will receive a failing or incomplete grade. 8. The BB assignment should be refreshed or changed for each new snow day, or if the class unit/chapter has changed. 9. Teachers in grades K-6 should collaborate on the assignment as much as possible so that there is consistency between buildings.